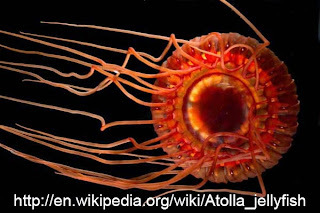 Atolla wyvillei is a jellyfish which is commonly called the Atolla jellyfish. That is sort of cheating when it comes to common names because it is also the genus name. 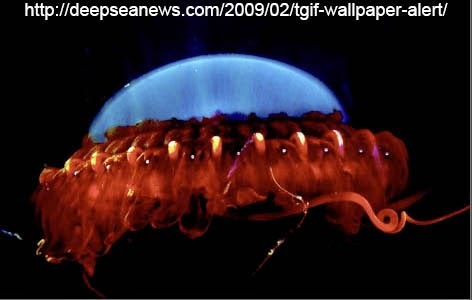 These deep sea jellyfish look a little bit like an alien spacecraft. But the aliens must have put an alarm on it because when they are attacks the Atolla jellyfish will produce light in flashes on and off. It is believed that this behavior attracts even bigger predators who are likely to go after whatever is hunting the jellyfish. Atolla jellyfish can be found in all the world's oceans at depths from 500 to 5000 meters.